The consequences of being charged with drug possession in the state of Massachusetts can have a significant impact on someone’s life. The charges can mean jail time and a serious blot on someone’s personal record. That is why having a knowledgeable attorney to handle the case is important. The attorneys at Michael M. Monopoli Law Firm are here to help. Michael and Mark have over 30 years combined experience in handling criminal cases in Worcester County, Framingham, and Marlborough areas. They’re knowledge and experience can help anyone facing a drug possession charge to possibly receive a lesser sentence or be relieved of the charges altogether. In order to understand the state laws regarding drug possession charges in Massachusetts, we’ve put together some information to make it clearer. In the state of Massachusetts, drug possession is defined as an individual knowingly and intentionally possessing a controlled substance. 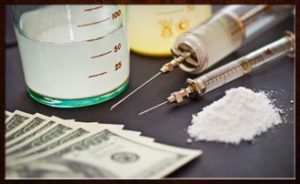 The consequences of drug possession can vary, depending upon the type of substance, the amount of substance, whether this is a first, second, third offense, etc. There are four classes of substances as defined by the state of Massachusetts: Classes A, B, C, D and E.
Class A substances includes the harder drugs and the most commonly charged substance, Heroin. Heroin is considered one of the most dangerous substances and is therefore charged accordingly. Typical consequences for Heroin possession could include up to two to three years in jail. Class B substances include drugs such as Cocaine, Ecstasy, amphetamines, and other related substances. Individuals caught in possession of Class B substance usually receive a punishment of one to two years in prison if charged. Class C substances are relaxers or mood stabilizers. Typical punishment is up to two years minimum. Class D substances are marijuana, which is not considered a crime to possess in the state of Massachusetts unless it exceeds one ounce, which is then considered illegal possession. If you are charged with illegal possession of marijuana, there could be jail time in the charges or lesser charges such as drug rehab and fines can be negotiated with the right attorney. Class E substances include some prescription drugs for the use of anxiety, depression, etc. An individual is charged with Class E possession if they are caught in possession of the drug and do not have a valid prescription for it. There is usually no time in prison for possession of a Class E substance but the individual can be put on probation or treatment and the charge will be on their permanent record. If you or someone you know are facing charges for drug possession and are in need of an attorney, Mark and Michael Monopoli are here to help. They have a high success rate for reducing charges or getting charges thrown out altogether. They will look at the details of every case to be sure that the search was conducted legally and see what they can negotiate on behalf of every individual they work with. Contact their office today to see how they can help.